34G OF LEAN PROTEIN - Making it the perfect complete breakfast meal replacement or a recovery smoothie or shake after your workout. GLUTEN FREE, LOW SUGAR, PACKED WITH SUPERFOODS - Made with 100% certified gluten free whole grain oats, chia seeds, flax, maca powder, custom whey protein, and real fruit. Ingredients like Ghirardelli chocolate, PB2 peanut butter, real vanilla bean, and Vermont maple syrup make Oats Overnight the best tasting oatmeal on the market. 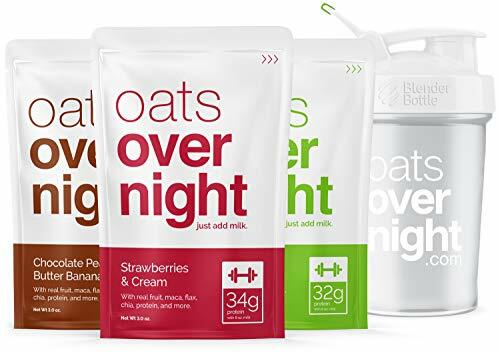 THE LARGEST SERVING SIZE - Includes three 80g+ packs (one of each flavor) and a custom high-quality BlenderBottle shaker, perfect for taking breakfast on-the-go during those busy mornings. Guaranteed to keep you full until lunchtime, no more junk food cravings! 3 DELICIOUS FLAVORS - Chocolate Peanut Butter Banana, Strawberries & Cream, and Green Apple Cinnamon. You won't want to hit snooze knowing your Oats Overnight is waiting for you in the fridge! Final Price as low as $17.00 Shipped!